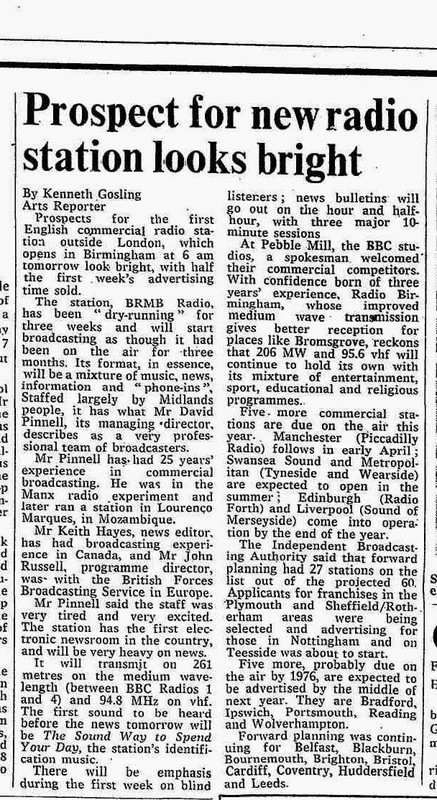 In the 1960s, with a sniff of commercial radio in the air, a number of enterprising folk across the Country, not least those in local press, thought the whole thing sounded pretty exciting. Companies were duly formed, with the aspiration of operating a franchise for this prospective new medium. Few of those far-sighted enthusiasts had any idea quite how long they'd have to wait. In Birmingham, such a company was Birmingham Broadcasting Ltd. With Elvis Presley at Number One, and Macmillan at Number Ten, it held its first Board meeting in March 1961. The records of that meeting were neatly typed on foolscap and have been kept safely to this day, along with those from all the subsequent early gatherings. They live in a weighty black volume which was uncovered recently in a clear-out at Free Radio. Allow me to flick through the dusty pages. The inaugural minutes suggest there wasn't a tremendous amount of excitement at that first gathering. It amounted to formal agreement on Articles of Association and bank accounts. The directors were also fairly unlikely to squabble, given they were both also directors of the Birmingham Mail group. Directors’ reports and accounts were duly approved at successive 'meetings' of BBL - monthly - for the next ten years. The only excitement loomed when one of the directors acquired another directorship, possibly as a result of just being bored of waiting. October 1972. 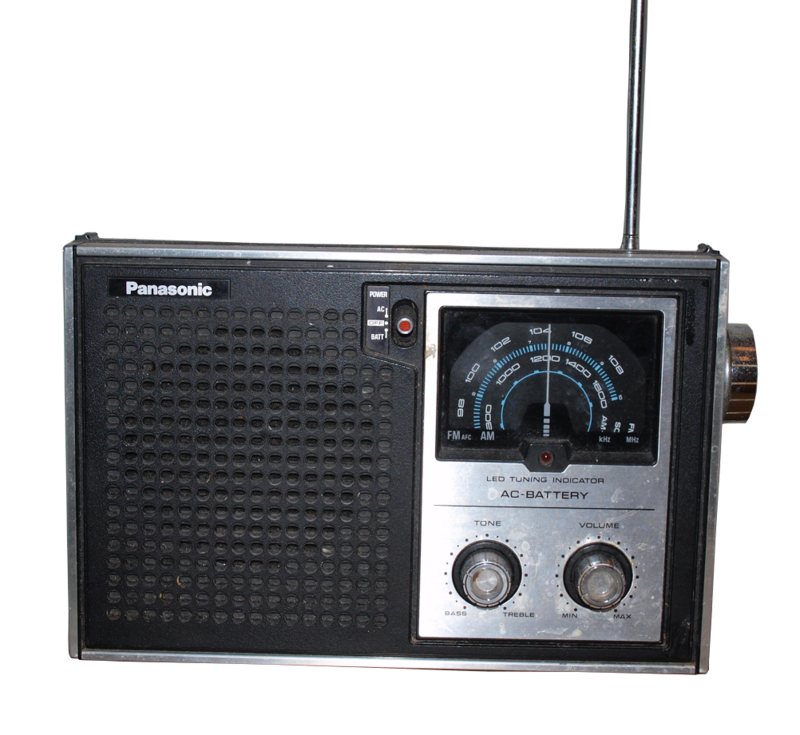 Following the change of Government from red to blue, things started to move, and commercial radio became a real possibility. 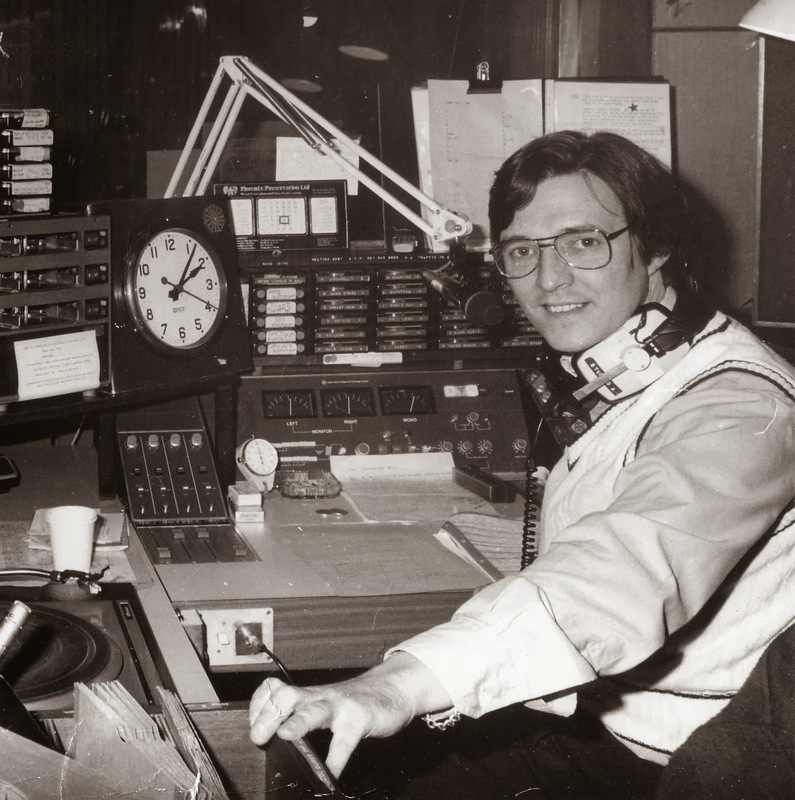 David Pinnell was duly appointed Managing Director, swiftly joined by John Russell, and John Parkinson, both of whom were to figure in the history of commercial radio in the Midlands for several years. The application to the IBA for the franchise was duly assembled. Then, on 30th November 1972, the directors met and agreed ‘after some discussion’ that the application document (I've summarised it on that link - it's fascinating!) should be submitted to the regulator as part of the competitive pitch. John and David were congratulated, rightly, on its ‘form and presentation’. January 1973 must have been a nail-biting meeting, likely with several trolleys of tea being pushed into the board room, alongside a plate of Penguin biscuits. Whilst the application had been submitted, nothing further had been heard, although an interview was expected in ‘two or three weeks time’. The Board appeared confident, however, with much of that meeting dominated by prosaic discussion on how staff might be recruited and equipment leasing. 6th February 1973 was little better. The minutes suggest that the first meeting with the IBA regulator on Jan 31st had proceeded satisfactorily, but a second one was anticipated. The board remained ‘hopeful of the ultimate outcome’. A query on the positions of the Mail Directors on the Board had evidently been raised at interview: a letter had been despatched to the IBA and a response received. One Board member suggested, wrongly as it transpired, that only one other licence application was expected. Possibly whilst kicking their heels, conversation at the meeting then turned to pension arrangements. 12th March 1973. Was the sherry brought out from the MD’s cabinet? 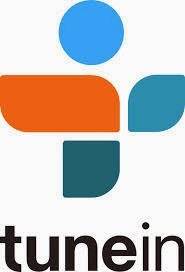 The Chairman reported solemnly that the Company had been awarded "the contract for Independent Radio", on certain conditions, including the requirement that a member of the rival Birmingham Independent Radio consortium be invited to join the Board. Back then, such IBA marriage-broking was commonplace, and often sensible. It was also agreed that a nominal fee would be paid to the Chief Engineer until such time as he began full time employment. I should imagine they rather needed his goodwill and commitment. By the Board meeting of April 73, an on-air date of 1st April 1974 was being mooted, although 1st February ‘might be achieved’. History tells how they improved upon their more cautious estimates. By November 1973's Board meeting, things were hotting up. David Pinnell reported that work on the Aston premises appeared to be progressing satisfactorily. The third and fourth floors of the former ATV/ABC premises at Aston would soon be completed; and then work could begin on the studio complex. A worry was expressed that overtime might have to be worked. The minutes go on to reveal that a generator had sensibly been acquired, at a cost of £2200. Staff would move to Aston on 8th December, and the premises would be operational from the 10th. The Board was chuffed that orders for £25,000 of ad sales for the first three months had been processed. In a touch of light relief, although I suspect there were a few interventions along the way, John Russell took the Board through the programme schedule. January 1974. The calls on capital continued; and the money came in. Sadly though, there were no new developments "with regard to the staff canteen". Morale was reported as good ‘despite the lack of a lift”. The programme schedule had been submitted to the IBA, although the regulator had not yet responded. Indeed, concern was expressed that if it were generally to take the IBA six weeks to consider any changes in programmes, the industry should press for a ‘more flexible approach’ to regulation. Later, it did. Boy, it did. News was discussed, and the Board was assured that there would be a ’newsman’ on duty 24 hours a day, despatching a 5 minute bulletin every day on the hour and a 3 minute bulletin on every half hour . The Sales Director, Mr Davies was a little less sanguine. He noted a few airtime order cancellations owing to the ‘present economic crisis'. Incentives for advertisers were wisely created. 19th February 1974 - the station went on air. 25th February 1974. The station was now settled on-air; and the Board met to review those breathless early moments. 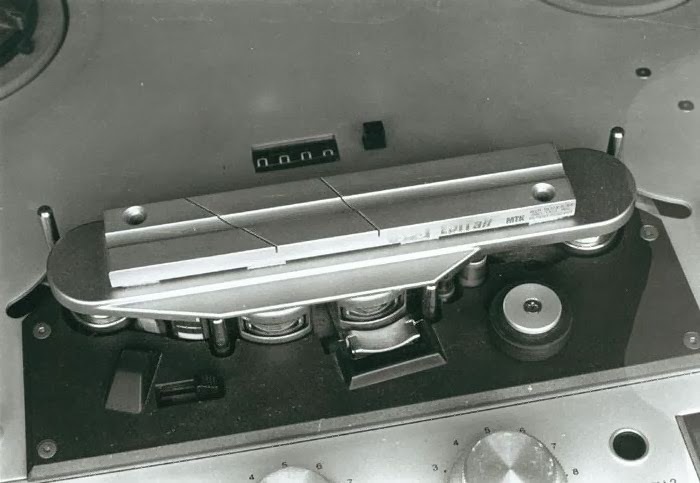 It had all gone well “despite the breakdown of the IBA transmitter”. Sounds pretty terminal to me. Views from the non-exec directors on programmes were invited (always a dangerous move, I find). "Professional" said one; “phone in shows were refreshingly different” added another; and Mr Howard was ‘"impressed with the excellent reception as far south as Stratford". Maybe he lived there. The Sales Director was peculiarly positive for a Sales Director, reporting that £40000 was on the board for the first six weeks on-air. One director asked for a graph of this progress, only to be told that "this method had not been used at the moment" and to be content with the "record of future orders maintained by the accounts department". In other words ‘I’m trying to get a station on-air, don’t go asking for pretty graphs just now’. 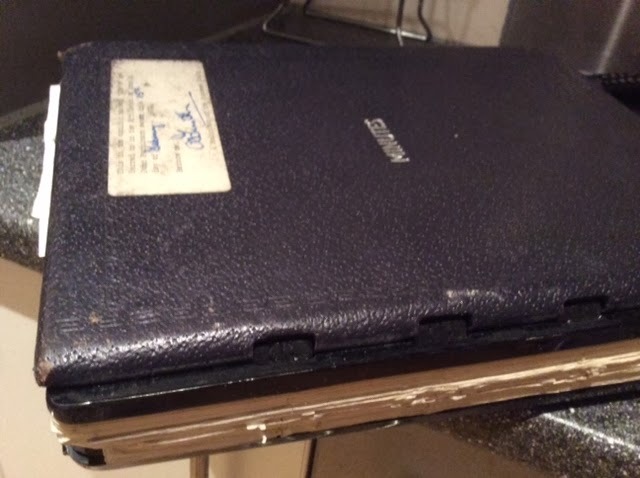 The Programme Director reported that the switchboard had been “jammed with calls”, not least for Tradio where people could "sell or swap household articles". The news staff were ‘full of enthusiasm’; not least because news gathering, news-writing and news reading were all performed by the same individuals. ‘Conventional journalists’, it was observed, appeared to quite enjoy that challenge. The Chairman had written cautiously to the IBA asking what their attitude would be and how '"they’d be prepared to help" in the event of the economic crisis resulting in revenue not being ‘at satisfactory levels’. No response was detailed. A "detailed discussion" was held on the sales bonus scheme. Some things never change. In other news: a staff bonus of 15% of monthly salary would be paid to all staff in March to say thanks. 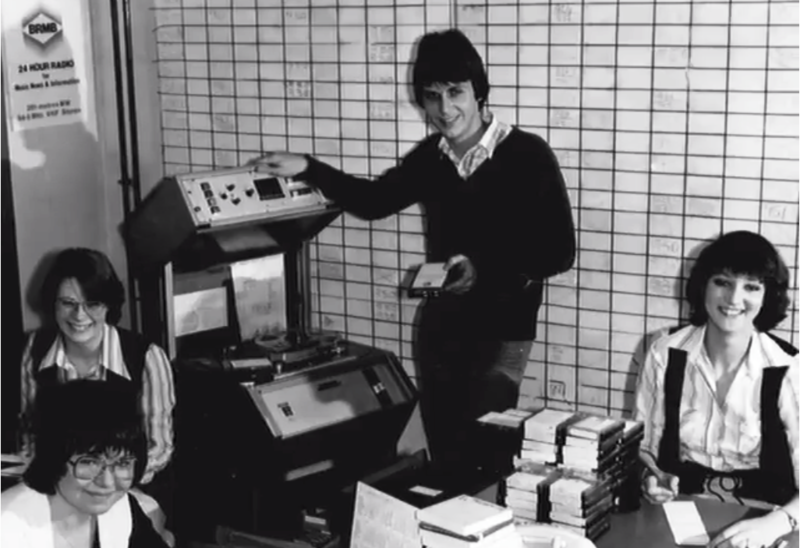 Commercial production was proving a challenge owing to the huge volume of work; the engineers wanted another engineer; and the Record Library needed an assistant to file away the Bay City Rollers records. Those extra moves might cost another 7k a year. If all else failed, it's lucky the Bank had authorised a £40,000 overdraft facility. Thirteen years. And the dream had become a reality. The first commercial station in England outside London was on the air. 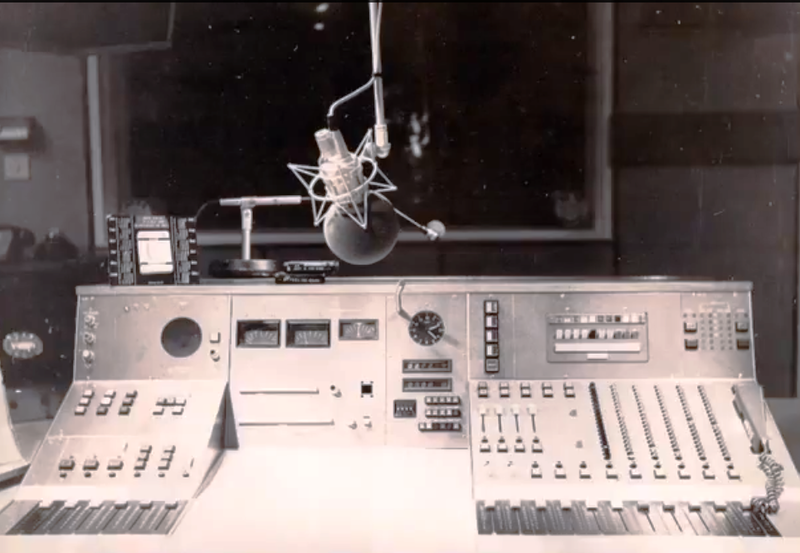 John V. Russell Tribute Part 1: Secrets of Local Radio from Jonathan Marks on Vimeo. Were the old days better? The early days of commercial radio were truly great. After all, back then, everything was local. Local ownership. Locally originated live output. Local management. Presenters could chatter away at will and show their personalities; and have a real influence on the songs they played. If you were on-air, you could expect to be in that slot for a very long time. No-one bothered much with pesky research; or troubled with many of those dreaded coaching sessions. There’s a view in some quarters that everything back in UK radio back in the 70s, 80s and early 90s was perfect; and everything now is just bad. A firm view that if it all went back to how it was, then life would be a whole lot better. I recall being a huge fan of Steve Merike on Trent in the '70s. He was my inspiration. I wanted to meet him. To talk to him. When he mentioned in one link on-air that he’d been walking round Bridgford Park, I started making a regular detour lest I might bump into him. I used to try calling in on-air, but when I got through, good old Jean answered the phone in the adjacent studio. That was as close as I got. You could write in to a station, of course, and then listen forever lest you got mentioned. Presenters wore silky jackets and sat on pedestals. Now, many radio presenters will be on social media merrily chatting to their listeners all hours of the day. They use their huge transmitters to open the door to conversations they then continue elsewhere, personally. Is that wrong? Or just different? You don’t like the music on the station? Well, whilst once you could have banged down the door and complained; now you resort to Twitter, and sensible stations likely respond. My colleagues and I respond every day to bundles of emails from listeners wanting a raffle prize, a dedication, or the answer to some random question; or they want to comment on a programme or ask how to get into radio. We try to reply to every single one. I would assert that, dependent on format, on many stations, the conduit between presenter and listener can be more personal than ever before. Last Winter, on a snowy January day, I was at home just before midnight, personally updating our rather impressive ‘snow closures’ system online, having received a dollop of late night emails from fraught head-teachers. Alongside colleagues poised at their PCs in their homes across town, we also updated a dynamic list of information for broadcast the following morning. And, frankly, I know my friends down at Heart were doing much the same. Years ago, a team of people would answer phones on-site for a period, and then go home. Now you have a continuously updated information feed, and you can consult it day or night. There is no doubt that, for the many stations who see this as something of value to them and their audiences, the quality of this service is hugely improved. I’m proud to have been part of the early pioneer ‘splitters’. I’d arrive at 4.30 for the Saturday breakfast show and pre-record links for the two Cities I broadcast to. The were recorded on tape, edited manually if needed and dubbed onto carts before being fired to their local transmitters. It took ages. Now, technology means that our presenters at Free Radio can record split links for our four areas at will, and fire them out. Stations have shared programming for a very long time, it's just now that we can do it better. It's crucial surely to have a station based in town? Well, not really. I care more about whether the presenter knows that they're doing. What proportion of any station's audience actually ever popped in? And listen back again to those 'local' stations of yesteryear; how local was the content of the music shows on many stations? Just slide off those rose-tinted specs. In the 80s, the Trent OB Land Rover was a dirty beast with an aerial reaching towards Mars. We’d telephone Alyson upstairs and book it for an OB a few weeks away; and three engineers would saunter up and drive us to the scene of the broadcast. In later times, we might plead with BT to install an ISDN for an OB afar. Either way, it was hardly immediate; and it cost a fortune. Now, you can broadcast from just about anywhere in the World. And with mobile phones now serving as high quality ‘tape recorders’ any journalist can report on anything, anywhere with ease. 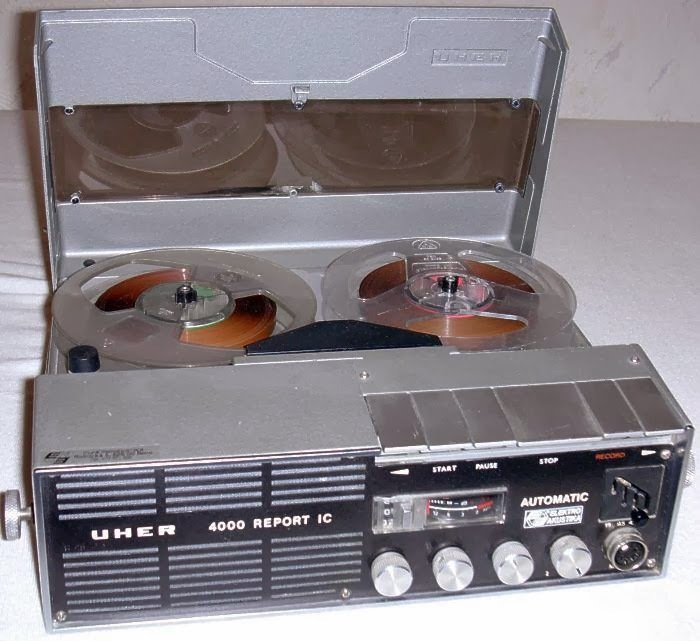 Discreetly too: I would not have wanted to send any of our team into the Birmingham riots with a UHER, thank you very much. Music was much better when every presenter chose their own songs. No it wasn’t. Some presenters can do a brilliant job of music scheduling. Most cannot. It is a very different skill from ‘communication’. I listen back to some battered old C90s of some stations from the early days and struggle to recognise many of the songs. Few would dispute that listeners like a considerable degree of music familiarity. It’s why they download their favourite songs. To achieve familiarity, you have to play the songs more often than most presenters would choose to play them. The only reason that listeners did not turn away from some ILR stations in days of old was there was simply nowhere else to go. Remember, one commercial station per market, Radio 1 not on FM, and Radio 2 playing pan pipes. The first sign of the ILR's FM weakness was what happened when the weaker ones created their own excellent, focused AM Gold competitors. remembered? Were the stories of interest? Who knows. The ‘press’ model of journalism was evident: news was often flashing blue light stories and council meetings. I applaud the often wrongly-maligned GWR for all its work in news thinking. I recall that Group asking the refreshing question ‘what are people really interested in?’. Journalists in the 70s and 80s might have debated that question with colleagues, but rarely would those conversations be fuelled with any deep understanding of listeners lives and worries. 'Beating the competition' was the key obsession. 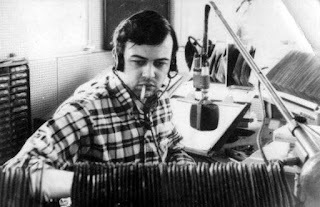 Commercial radio was once great for its rich range of programmes. Let me see now: Jazz on a Thursday night, Country on a Tuesday and so the list went on. Truly great news if you liked Jazz or Country. It wasn’t good for me though, as I wanted to hear the Dooleys. So, for the specialist hours, there was no station for me after 7 p.m. At all. Now, there is format consistency; and if you do want Country there are stations around the World to choose from. Breakfast show recordings from long ago are a painful reminder of a fun, yet random, period. You went on-air and you did it. 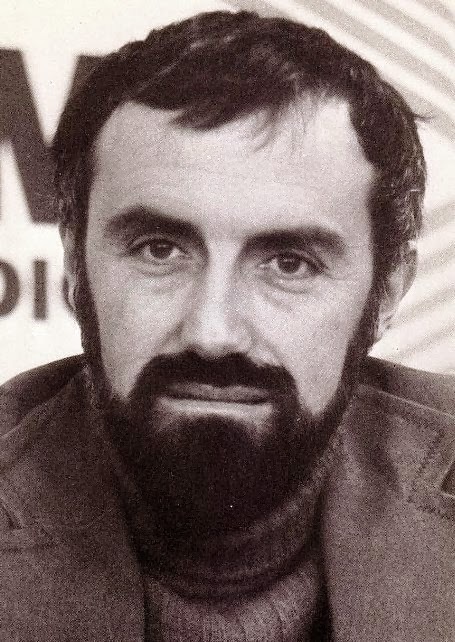 Some natural communicators produced shows of the highest order. Many did not. Now, visit any sensible radio station just after ten and you’ll find a gaggle of folk considering the day's show. What went well and what didn't? What are we planning for tomorrow? What’s the angle on this or that? How can we get listeners involved? The science of a breakfast show now is now significant. It's the experiment we can never do, but how great it would be to pitch one random old style show against one which stops every morning to ask 'what do listeners really want to hear in their lives when they wake up tomorrow?'. Which would win? What about 'Lost and Founds' though? And jumble sales. Radio was much better with those, surely. I suspect not. There are lots of places to issue announcements like that; much better suited to information listings than radio. After all, radio was once the only way to communicate a one-to-many message; now it is not. And, frankly, did folk really think "Hmmm. Think I’ll go out today. Let me turn on the radio and see if there’s a jumble sale to go to". 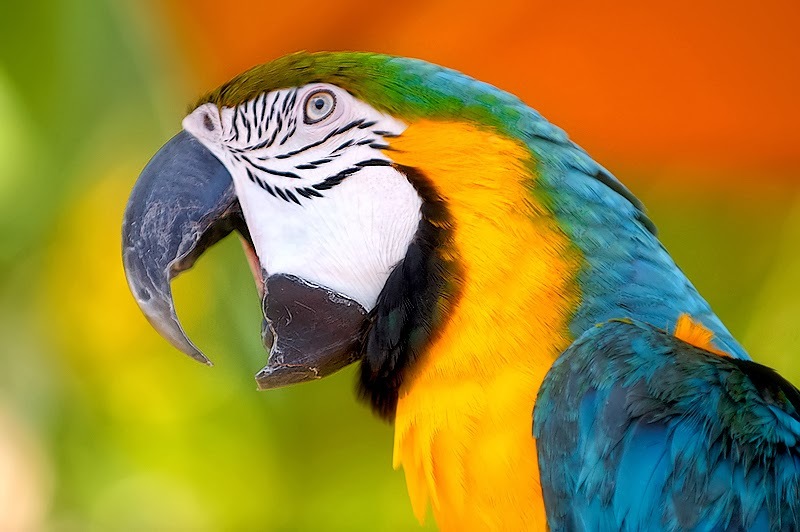 As for Fanny's lost parrot. I hope she finds it, but I'd rather hear a song. Local is better than regional surely? Let's pause to remember that when they were in different ownerships, stations would often stretch their TSAs as far as they could anyway. They wanted to trample on their neighbours and took delight in covering things across, well, the whole region. And it would be handbags at dawn for the sales people battling on the fringes. Charity auctions? They were fun years ago. But were they really better than some of the phenomenal local fundraisers around commercial radio now? Global's efforts have been huge in scale and the then GMG did notable work for Help for Heroes . Bauer's Cash for Kids enjoys impressive support; and we burst with pride at the c. £2m we've raised in just a few years at Free Radio and Gem 106 with 'Walk for Kids' or 'Give it Up'. I love and respect the past, and my #radiomoments are evidence of treasured memories and lessons learned. But I relish the excitement of the present too. As I often say, had commercial radio architecture been sensible, we would have had huge national music brands decades ago, supplemented by powerful single local stations where the markets can sustain them. Instead, we’ve had to engineer some sense painfully into the structure of this industry if it is to survive and thrive in the most challenging of economic times. It's unlikely to be a truly perfect result. barriers to entry been lower. Technology is cheap and a wealth of community stations and internet stations offer an easy platform. If you truly are good, you'll be found. One thing has not changed – the great radio communicator. Those people will always command an audience and the gifted are truly rare. I have a feeling that the restructuring of radio is now approaching completion; and the medium is finding its place in a different world. Different sorts of people will be involved. Radio can be a curated background blend of your favourite songs, or it can create a ripple of dialogue which can continue in many places, not just on the air. Another golden age of radio is beginning.